This was my third year using standards based grading with my classes. I wrote last year and the year before about my implementation. I had my WeinbergCloud implementation working from the beginning of the year, so it was part of the expectations I introduced on day one. I also adjusted this system a bit to make it easier to link the reassessments and the content of the standards. There seemed to be too much uncertainty about what each standard represented, which translated into more confusion when signing up for reassessments than I wanted. Creating a list of standards and resources associated with each standard shrank this gap. I did not limit the number of reassessments per day explicitly. I expected that students would not sign up for a ridiculous number given the limitations on their credits, which students earned by doing homework or coming to tutoring. I included time within at least one class a week per student during which students could do reassessments without having to come in outside of class time. Unit exams continued to be assessed purely on course standards, not points. Semester final exams were percentage based. I scaled all of my standards levels from 1 - 5 to be from 6 - 10 to make it easier to communicate the levels to parents and be consistent with our school grading policy of not giving numerical grades below 50%. No student actually received lower grades due to my system of adding a base grade to each standard, but the process of explaining to students and parents that a 1 was really a 60% (5 for the base grade + 1 for the standard level) was clearly more complex than it needed to be. For my combined IB HL/SL class, the HL students had standards that only they were responsible for learning, while also being responsible for the SL standards. More on this later. Students seemed to have a better understanding from the beginning of the year of what standards based grading and assessment was all about. I did a bit more deliberate instruction on the ideas behind it at the beginning of the year. I also had smaller classes than before, so I was better able to have individual conversations about signing up for reassessments and talking about the process. A small proportion of students were fully sold on the idea of reassessment as a learning tool. Some students reassessed at least twice a week throughout the semester, and these students had strong performances on the cumulative final exams. By the second unit exam, students were generally not leaving questions blank on assessments. They were trying their best to do some amount of work on each question. As with last year, I gave more challenging questions to assess the range of student ability. Most of these involved either multiple standards combined in one, more open ended responses, or questions requiring explanation. Assessing at the higher levels of mastery became strongly subjective, and students accepted this, though they occasionally advocated for themselves as to why they deserved to be marked higher. They generally felt that it was fair when arithmetic errors kept them in the 8/10 range. Having students report their mastery level when signing up for a reassessment made it much easier for me to know what problem type or category to give them. Furthermore, this made it easier to justify changing the mastery level higher after a successful reassessment, but not making it the highest level on the scale. A student that was a 6 and answered a couple of questions correctly might move to an 8, whereas a student that was previously an 8 would be given more challenging questions and some conversation explaining their understanding in order to move to a 10. It was my priority to get assessments back within the same period, and I estimate that I was able to do this more than 95% of the time. Simple, short, and carefully designed assessments can reveal quite a bit about what students do/don't understand. Similar to previous semesters, I had high participation of a small group of students, with far too many students choosing not to reassess until the very end of each semester. Some students did not initiate their own reassessments at all. Students again hoarded their credits to the end of the semester. I flirted with the idea of adding an expiration date to credits to discourage holding on to credits for long periods of time, but time constraints kept me from implementing this. As a consequence of credit-hoarding, students near the end of the semester signed up for absurd numbers of reassessments in a day - I believe the largest quantity was nine. I shared with students that a good rule of thumb for planning purposes is 10 minutes per reassessment, so doing five reassessments before school isn't practical, but that didn't come across well. Students that couldn't do all of their reassessments in the morning simply pushed them to later in the day. This was a problem for me because I never knew if students were going to show up according to their scheduled time, or just do everything after school. Canceling after no-shows at the end fixed this problem pretty efficiently, however. When a student would answer all questions correctly on an unannounced standards quiz, I generally assigned this a mastery level of 8 on a 6 - 10 scale. Students that had less than an 8 in this case usually had trouble with the same questions on a unit assessment or reassessment on the same standard later on. In other words, the students that had trouble initially learning a concept did not necessarily get the help they needed to make progress before the unit exam. This progress often happened after the exam, but this led to a lot of students falling behind pretty early on. I need to introduce interventions much earlier. These are the ideas I am mulling over implementing before school gets started in a month, and I'd love to hear what you think. Make credit expiration happen. This has been an issue for the year and a half of WeinbergCloud's existence. I threatened implementing this in speaking with students, and they were immediately asking me not to because it would prevent them from putting off reassessments as they preferred to do. This includes students that were doing the practice problems between classes anyway, so this wasn't just about losing the credits. Adding a "why not just give a reassessment a try" argument worked in face-to-face conversation with students that were hoarding credits, so forcing the process might be worth the effort. I understand that learning takes time, but many of the students putting off reassessment weren't actively reviewing the standards over time any way. I'd rather force the feedback cycle through more iterations since that is when students seem to learn the most. Introduce submitting work into the process of reassessment. This could be electronic ("To complete your sign up, submit a scan/photo of the work you have done to prepare") or could just be shown before I give them a reassessment. This would reduce some of the sign-ups that happen only based on the mastery score rather than reviewing the concepts that come with it. Students earn credits by doing practice problems or coming to tutoring, and these let them sign up for reassessments - this won't change. To actually go the final step and take the reassessment, I need to see what students have done to prepare. In some cases (students that see me the day before, for example) I may waive this requirement. Require X number of reassessments per two week cycle of the block schedule. This might be in lieu of the previous change, but I'm afraid this might encourage (rather than prevent) a rush of reassessments at the end of a two week period. On the other hand, if the goal is to increase opportunities for feedback, this might be more effective. Make it possible for students to sign-up for an appointment to go over (but not be assessed) material on a given standard. Reassessments are great opportunities for feedback, but sometimes students want to come in to go over material. I get emails from students asking this, but it might be easier to just include this within WeinbergCloud. Introduce skills/definition standards for each unit. This would be a standard for each unit that covers basic recall of information. I'll discuss why I want these (particularly in physics) in more detail within a later post. The short story is that I want to specifically assess certain concepts that are fundamental to all of the standards of a unit with a single binary standard. Classify standards mastery levels in terms of 'likelihood of success'. This is a lower priority, and when I tried to explain this to a colleague, she wasn't convinced it would be worth the effort. If you have a 10, it means you have a 95% or higher likelihood of answering anything I give you correctly. The probabilities might not scale linearly - a 9 might mean between 90-95%, an 8 between 75% and 90, etc. I don't know. The reason I want to do this is to justify giving a 10 to students that have demonstrated solid proficiency without requiring perfection, and have a better reason for only raising a student from a 6 to an 8 after answering a couple questions on a single reassessment. Right now the difference between an 8, 9, and 10 are defined (in order) by answering questions correctly on a single standard quiz, a comprehensive unit exam, and correctly answering stretch questions correctly. A student that gets an 8 on a standards quiz before an exam might then answers related questions incorrectly on the multi-standards exam and remains an 8. If this student then takes a quiz on a single standard and answers that question correctly, does it make sense to then raise their mastery level above 8? This is what I often do. I can also control for this by giving a more challenging question, but I'm not sure I need to. In short, something is fishy here, and I need to think it out more in order to properly communicate it to students. In my head, I understand what I want to communicate: "yes, you answered these questions correctly, but I'm still not convinced that you understand well enough to apply the concepts correctly next time." This is not the highest priority out of the ones I've mentioned here. As always, I appreciate your feedback. Thanks for reading! This was my second year using standards based grading with my classes. I wrote last year about how my first iteration went, and made some adjustments this year. I continued using my 1-5 standard scale and scale rubric that I developed last year. This is also described in the post above. As I wrote about in a previous post, I created an online reassessment organization tool that made it easier to have students sign up and organize their reassessments. I included a number of projects that were assessed as project standards using the same 1-5 scale. the rubric for this scale was given to students along with the project description. Each project, like the regular course learning standards, could be resubmitted and reassessed after getting feedback and revising. My rate of reassessment was substantially better in the second semester. I tweeted out this graph of my reassessments over the course of the semester: There was a huge rush at the end of the semester to reassess - that was nothing new - but the rate was significantly more consistent throughout. The volume of reassessments was substantially higher. There were also fewer students than in the first semester that did not take advantage of reassessment opportunities. Certain students did make up a large proportion of the total set of reassessments, but this was nowhere near as skewed a distribution as in the first semester. Students took advantage of the project standards to revise and resubmit their work. I gave a living proof project that required students to make a video in which they went through a geometric proof and explained the steps. Many students responded to my feedback about mathematical correctness, quality of their video, and re-recorded their video to receive a higher grade. Student attitude about SBG was positive at the end of the year. Students knew that they could do to improve their grade. While I did have blank questions on some unit assessments, students seemed to be more likely to try and solve questions more frequently than in the past. This is purely a qualitative observation, so take that for what it is. Students hoarded their reassessment credits. This is part of the reason the reassessment rush was so severe at the end of the semester. Students didn't want to use their credits until they were sure they were ready, which meant that a number were unused by the end of the year. Even by the end of the year, more than a quarter of credits that had been earned weren't used for reassessments. <p\> I don't know if this means I need to make them expire, or that I need to be more aggressive in pursuing students to use the credits that they earned. I'm wrestling a lot with this as I reflect this summer. I need to improve the system for assessing during the class period. I had students sign up for reassessments knowing that the last 15 - 20 minutes of the class period would be available for it, but not many took advantage of this. Some preferred to do this before or after school, but some students couldn't reassess then because of transportation issues. I don't want to unfairly advantage those who live near the school by the system. I need to continue to improve my workflow for selecting and assigning reassessments. There is still some inefficiency in the time between seeing what students are assessing on and selecting a set of questions. I think part of this can be improved by asking students to report their current grade for a given standard when signing up. Some students want to demonstrate basic proficiency, while others are shooting for a 4 or 5, requiring questions that are a bit higher level. I also might combine my reassessment sign up web application and the quiz application so that I'm not switching between two browser windows in the process. Students want to be able to sign up to meet with me to review a specific standard, not just be assessed on it. If students know specifically what they want to go over, and want some one-on-one time on it since they know that works well for them, I'm all for making that happen. This is an easy change to my current system. Students should be able to provide feedback to me on how things are going for them. I want to create a simple system that lets students rate their comprehension on a scale of 1 - 5 for each class period. This lets students assess me and my teaching on a similar scale to what I use to assess them, and might yield good information to help me know how to plan for the next class. I've had some great conversations with colleagues about the ways that standards based grading has changed my teaching for the better. I'm looking forward to continuing to refine my model next year. The hard part is deciding exactly what refinements to make. That's what summer reflection and conversations with other teachers is all about, so let's keep that going, folks. I am gearing up for another year, and am sitting in my new classroom deciding the little details that need to be figured out now that it is the "later" that I knew would come eventually. Last year was the first time I used SBG to assess my students. One year in, I understand things much better than when I first introduced the concept to my students. By the end of the year, they were pretty enthusiastic about the system and appreciated that I had made the change. All students reassessing at the same time means no issues with scheduling time for retakes. Students that have already demonstrated their ability to work independently to apply content standards are given an opportunity to do so in the context of all of the standards of the unit. They need to decide which standards apply in a given situation, which is a higher level rung of cognitive demand. This is why students that perform well on a unit exam usually move up to a 4 or 5 for the related standards. I also like the unintended connection to the software term unit testing in which the different components of a piece of software are checked to see that they function independently and in concert with each other. This is what we are interested in seeing through reassessment, no? My question to the blogosphere is to fill in the holes of my understanding here. What are the other reasons to have unit exams? Or should I get rid of them altogether and just have more scheduled extended times to reassess consistently, regardless of progress throughout the content of the semester? This is the second post reflecting on this past year and I what I did with my students. My first post is located here. I wrote about this year being the first time I went with standards based grading. One of the most important aspects of this process was creating the learning standards that focused the work of each unit. I set out to create learning standards for each unit of my courses: Geometry, Advanced Algebra (not my title - this was an Algebra 2 sans trig), Calculus, and Physics. While I wanted to be able to do this for the entire semester at the beginning of the semester, I ended up doing it unit by unit due to time constraints. The content of my courses didn't change relative to what I had done in previous years though, so it was more of a matter of deciding what themes existed in the content that could be distilled into standards. This involved some combination of concepts into one to prevent the situation of having too many. In some ways, this was a neat exercise to see that two separate concepts really weren't that different. For example, seeing absolute value equations and inequalities as the same standard led to both a presentation and an assessment process that emphasized the common application of the absolute value definition to both situations. The most powerful payoff in creating the standards came at the end of the semester. Students were used to referring to the standards and knew that they were the first place to look for what they needed to study. Students would often ask for a review sheet for the entire semester. Having the standards document available made it easy to ask the students to find problems relating to each standard. This enabled them to then make their own review sheet and ask directed questions related to the standards they did not understand. The standards focus on what students should be able to do. I tried to keep this focus so that students could simultaneously recognize the connection between the content (definitions, theorems, problem types) and what I would ask them to do with that content. My courses don't involve much recall of facts and instead focus on applying concepts in a number of different situations. The standards helped me show that I valued this application. Writing problems and assessing students was always in the context of the standards. I could give big picture, open-ended problems that required a bit more synthesis on the part of students than before. I could require that students write, read, and look up information needed for a problem and be creative in their presentation as they felt was appropriate. My focus was on seeing how well their work presented and demonstrated proficiency on these standards. They got experience and got feedback on their work (misspelling words in student videos was one) but my focus was on their understanding. The number standards per unit was limited to 4-6 each...eventually. I quickly realized that 7 was on the edge of being too many, but had trouble cutting them down in some cases. In particular, I had trouble doing this with the differentiation unit in Calculus. To make it so that the unit wasn't any more important than the others, each standard for that unit was weighted 80%, a fact that turned out not to be very important to students. The vocabulary of the standards needs to be more precise and clearly communicated. I tried (and didn't always succeed) to make it possible for a student to read a standard and understand what they had to be able to do. I realize now, looking back over them all, that I use certain words over and over again but have never specifically said what it means. What does it mean to 'apply' a concept? What about 'relate' a definition? These explanations don't need to be in the standards themselves, but it is important that they be somewhere and be explained in some way so students can better understand them. Example problems and references for each standard would be helpful in communicating their content. I wrote about this in my last post. Students generally understood the standards, but wanted specific problems that they were sure related to a particular standard. Some of the specific content needs to be adjusted. This was my first year being much more deliberate in following the Modeling Physics curriculum. I haven't, unfortunately, been able to attend a training workshop that would probably help me understand how to implement the curriculum more effectively. The unbalanced force unit was crammed in at the end of the first semester and worked through in a fairly superficial way. Not good, Weinberg. Standards for non-content related skills need to be worked in to the scheme. I wanted to have some standards for year or semester long skills standards. For example, unit 5 in Geometry included a standard (not listed in my document below) on creating a presenting a multimedia proof. This was to provide students opportunities to learn to create a video in which they clearly communicate the steps and content of a geometric proof. They could create their video, submit it to me, and get feedback to make it better over time. I also would love to include some programming or computational thinking standards as well that students can work on long term. These standards need to be communicated and cultivated over a long period of time. They will otherwise be just like the others in terms of the rush at the end of the semester. I'll think about these this summer. I'd love to hear your comments on these standards or on the post - comment away please! This is the first in a series of posts about things I did with my classes this year. How would students respond to the change? How would my own use of SBG change over the course of the year? How would using SBG change the way I plan, teach, and assess? These questions will all be answered as I reflect in this post. In the beginning of the year, I used a purely binary system of SBG - were students proficient or not? If they were proficient, they had a 5/5. Not yet proficient students received a 0/5 for a given standard. All of these scores included a 5 point base grade to be able to implement this in PowerSchool. As the semester went on, the possible proficiency levels changed to a 0, 2.5, or 5. This was in response to students making progress in developing their skills (and getting feedback on their progress through Blue Harvest but not seeing visible changes to their course grade. As much as I encouraged students not to worry about the grade, I also wanted to be able to show progress through the breakdown of each unit's skills through PowerSchool. It served as a communication channel to both parents and the students on what they were learning, and I could see students feeling a bit unsatisfied by getting a few questions correct, but not getting marked as proficient yet. I also figured out that I needed to do more work defining what it meant to be proficient before I could really run a binary system. 1 - You've demonstrated basic awareness of the vocabulary and definitions of the standard. You aren't able to solve problems from start to finish, even with help, but you can answer yes/no or true or false questions correctly about the ideas for this standard. 2 - You can solve a problem from start to finish with your notes, another student, or your teacher reminding you what you need to do. You are not only able to identify the vocabulary or definitions for a given skill, but can substitute values and write equations that can be solved to find values for definitions. If you are unable to solve an equation related to this standard due to weak algebra skills, you won't be moving on to the next level on this standard. 3 - You can independently solve a question related to the standard without help from notes, other students, or the teacher. This score is what you receive when you do well on a quiz assessing a single standard. This score will also be the maximum you will receive on this standard if you consistently make arithmetic or algebraic errors on problems related to this standard. 4 - You have shown you can apply concepts related to this standard on an in-class exam or in another situation where you must identify which concepts are involved in solving a problem. This compares to success on a quiz on which you know the standard being assessed. You can apply the content of a standard in a new context that you have not seen before. You can clearly explain your reasoning, but have some difficulty using precise mathematical language. 5 - You have met or exceeded the maximum expectations for proficiency on this standard. You have completed a project of your own design, written a program, or made some other creative demonstration of your ability to apply this standard together with other standards of the unit. You are able to clearly explain your reasoning in the context of precise mathematical definitions and language. All of the standards in a unit were equally weighted. All units had between 5 and 7 standards. In most classes, the standards grade was 90% of the overall course grade, the exception being AP Calculus and AP Physics, where it was 30%. In contrast to first semester, students needed to sign up online for any standards they wanted to retake the following day. The maximum number of standards they could retake in a day was limited to two. I actually held students to this (again, in contrast to first semester), and I am really glad that I did. Before I start my post, I need to thank Daniel Schneider for his brilliant post on how SBG changes everything here. I agree with the majority of his points, and will try not to repeat them below. Students were uniformly positive about being able to focus on specific skills or concepts separate from each other. The clarity of knowing that they needed to know led some students to be more independent in their learning. Some students made the conscious decision to not pursue certain standards that they felt were too difficult for them. The most positive aspect of their response was that students felt the system was, above all else, a fair representation of their understanding of the class. Defining the standards at the beginning of the unit was incredibly useful for setting the course and the context for the lessons that followed. While I have previously spent time sketching a unit plan out of what I wanted students to be able to do at the end, SBG required me not only to define specifically what my students needed to do, but also to communicate that definition clearly to students. That last part is the game changer. It got both me and the students defining and exploring what it means to be proficient in the context of a specific skill. Rather than saying "you got these questions wrong", I was able to say "you were able to answer this when I was there helping you, but not when I left you alone to do it without help. That's a 2." SBG helped all students in the class be more involved and independent in making decisions about their own learning. The strongest students quickly figured out the basics of each standard and worked to apply them to as many different contexts as possible. They worked on communicating their ideas and digging in to solve difficult problems that probed the edges of their understanding. The weaker students could prioritize those standards that seemed easiest to them, and often framed their questions around the basic vocabulary, understanding definitions, and setting up a plan to a problem solution without necessarily knowing how to actually carry out that plan. 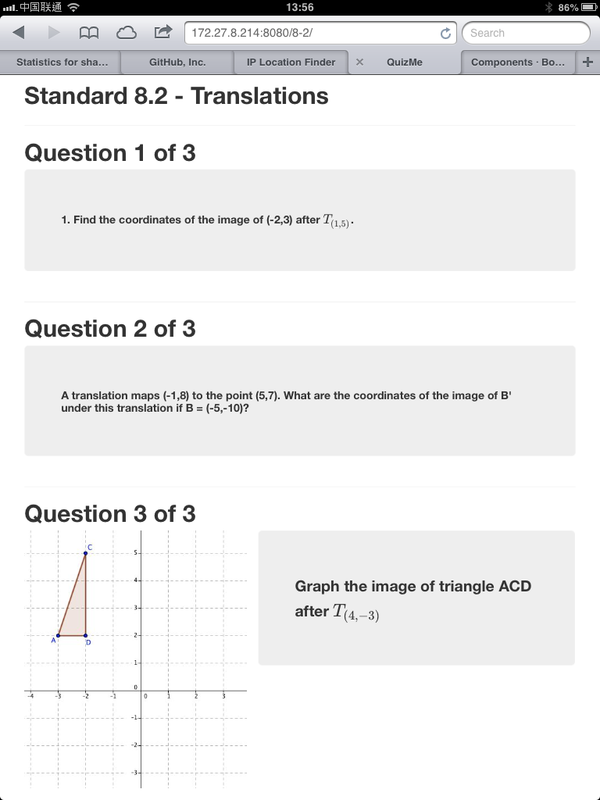 I also changed my questions to students based on what I knew about their proficiency, and students came to understand that I was asking a level 1 question compared with a level 3 question. I also had some students giving a standards quiz back to me after deciding that they knew they weren't ready to show me what they knew. They asked for retakes later on when they were prepared. That was pretty cool. Every test question was another opportunity to demonstrate proficiency, not lose points. It was remarkably freeing to delete all of the point values from questions that I used from previous exams. Students also responded in a positive way. I found in some cases that because students weren't sure which standard was being assessed, they were more willing to try on problems that they might have otherwise left blank. There's still more work to be done on this, but I looked forward to grading exams to see what students did on the various problems. *Ok, maybe look forward is the wrong term. But it still was really cool to see student anxiety and fear about exams decrease to some extent. Students want more detail in defining what each standard means. The students came up with the perfect way to address this - sample problems or questions that relate to each standard. While the students were pretty good at sorting problems at the end of the unit based on the relevant standards, they were not typically able to do this at the beginning. The earlier they understand what is involved in each standard, the more quickly they can focus their work to achieve proficiency. That's an easy order to fill. I need to do more outreach to parents on what the standards mean. I thought about making a video at the beginning of the year that showed the basics, but I realize now that it took me the entire year to understand exactly what I meant by the different standards grades. Now that I really understand the system better, I'll be able to do an introduction when the new year begins. The system didn't help those students that refuse to do what they know they need to do to improve their learning. This system did help in helping these students know with even more clarity what they need to work on. I was not fully effective in helping all students act on this need in a way that worked for them. Reassessment isn't the ongoing process that it needs to be. I had 80 of the 162 reassessment requests for this semester happen in the last week of the semester. Luckily I made my reassessment system in Python work in time to make this less of a headache than it was at the end of the first semester. I made it a habit to regularly give standards quizzes between 1 or 2 classes after being exposed to the standard for the first time. These quizzes did not assess previous standards, however, so a student's retake opportunities were squarely on his or her own shoulders. I'm not convinced this increased responsibility is a problem, but making it an ongoing part of my class needs to be a priority for planning the new year. I am really glad to have made the step to SBG this year. It is the biggest structural change I've made to my grading policy ever. It led to some of the most candid and productive conversations with students about the learning learning process that I've ever had. I'm going to stop with the superlatives, even though they are warranted. Why SBG is blowing my mind right now.